I used two good references when doing DotSVN. The first is (obviously) the SVN code itself. It is written in C using Apache Portable Runtime (APR). ... a pure Java Subversion client library. You would like to use SVNKit when you need to access or modify Subversion repository from your Java application, be it a standalone program, plugin or web application. Being a pure Java program, SVNKit doesn't need any additional configuration or native binaries to work on any OS that runs Java. I used VStudio's 'Java Language Conversion Assistant 3.0' to create a C# version of the SVNKit code. 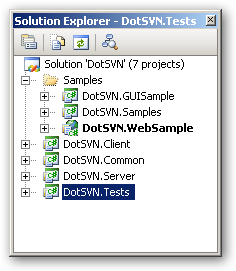 Though it had thousands of migration errors, this exercise gave me a good idea of the effort involved in completing DotSVN. I used the skeleton code from the migration as the basis for most of the my classes. DotSVN depends more heavily on .Net base class libraries (like Deflate stream, custom Date parsing etc). It also uses generics and collection classes more efficiently.